Nature in full force is a beautiful spectacle. Where do the colors come from? How did the clouds become tinged with that faint magenta tone when all the light seems to be mixed into a grey? To stand in the path of all that energy and let it sweep towards me is one of the joys of living in nature. I always experience the feeling that I must go out into it rather than run for shelter. It was the same for me during my years photographing on Cape Cod. When the weather was at it’s worst – then it was at its best – and the invitation was clear; be in it! 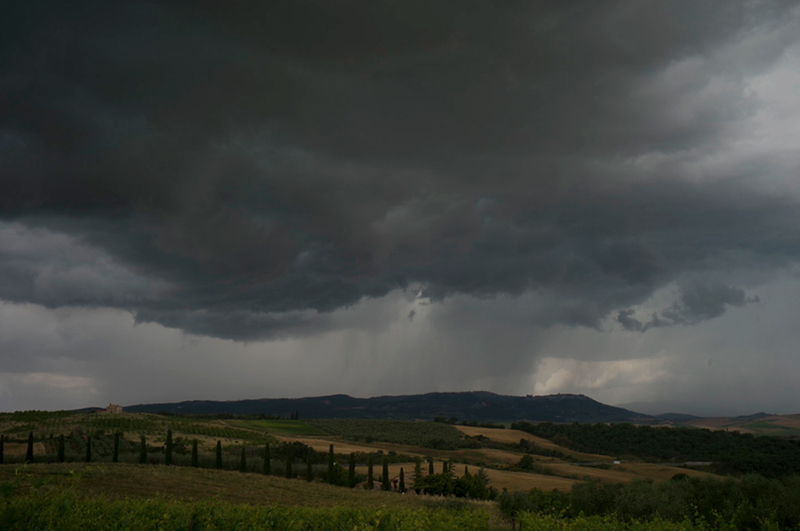 This entry was posted in Italy, Light, Storm, Tuscany, Weather and tagged Landscape, Light, Storm, Tuscany, Weather on June 28, 2015 by joelmeyerowitz2014.